Could understanding the diffusion of innovations help in entrepreneurship? The diffusion of innovations has been studied by many scholars over the ages, but notably from 1970 onward by American sociologist Everett Rogers. Rogers was interested in trying to get farmers to adopt innovations that could better their lives and make their businesses more productive. He pondered the forces that lead some to adopt and others to abstain. 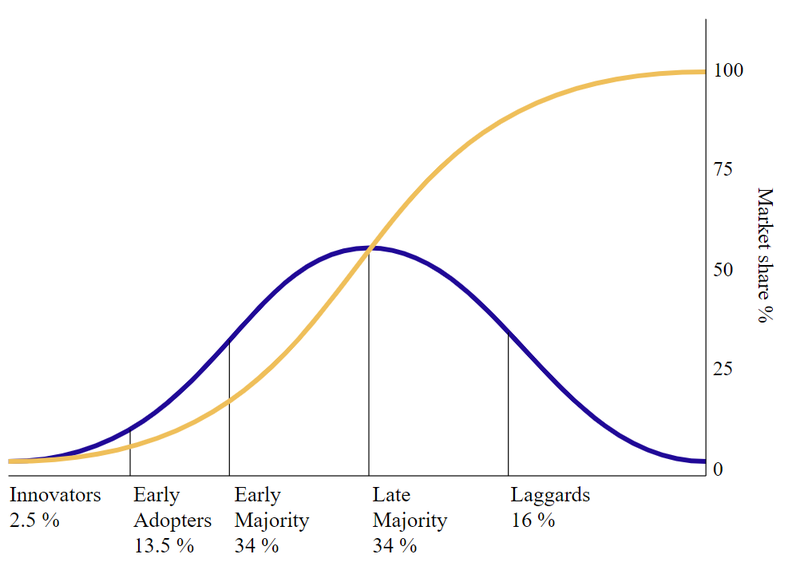 He suggests that different types of adopters: innovators, early adoptions, early majority, late majority and laggards have different adoption criteria. For instance, a strategy that may attract early adopters may not attract the early majority because they want different things. The size distributions of the different types of adopters (i.e., number of members of a particular adopter category), grow and then shrink giving rise to an inverted u-shaped curve, giving rise to the famous s-curve of total adoption. Rogers noted that it is not always the best technologies that get adopted, it is often the most convenient. The learning curve involved with a product is often a much higher cost to the user than the maker anticipates. The core assumption of the theory is that innovations do not automatically spread to large segments of a population. Instead, there are many different types of impediments to the diffusion of innovations. The diffusion of innovations is a stochastic process involving random probabilities, but it also can be influenced by strategies that change the odds. In order to cause an innovation to diffuse, an entrepreneur needs to help the innovation to surmount most of these barriers to diffusion (e.g, sunk costs, switching costs, learning costs, and material costs of buying new technologies). Other uses of the diffusion of innovations theory include Ramani et al. (2012) who suggest that sanitation entrepreneurs use a market making strategy of education, innovation, and sanitation together to ensure the continued use of their products. They fill a void in the market for knowledge about sanitation and its technologies and maintenance. Perhaps another way to influence the diffusion of innovations is to try to regulate it with formal institutions. Mintrom (1997) suggests that policy entrepreneurs actively try to influence government to favor the adoption of their technologies. Perhaps they are key in the diffusion of innovations because of their ability to bypass the market to forces of adoption, forcing adoption and throwing the innovation into an artificial, but not necessarily unsustainable diffusion trajectory. Moore and McKenna (1999) clarified the implications of the diffusion curve for entrepreneurs. They are summarized by the idea of "crossing the chasm". 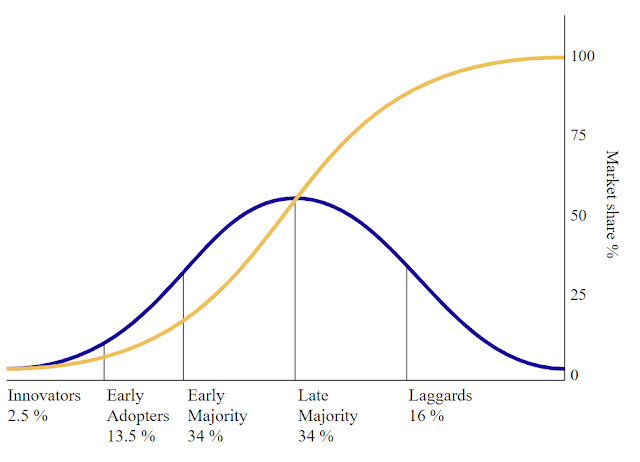 The chasm refers to the space between early adopters and the early majority on Roger's chart. These two groups of adopters are different and buy based on different metrics (or dimensions of performance). Moore notes that most entrepreneurs are not able to make the leap from the early adopters to the early majority. He argues that to cross the chasm, an entrepreneur must select one viable niche to cater to, thus putting all their 'eggs in one basket'. Crossing the chasm requires that the entrepreneur introduce what Moore calls the "whole product", which is 100% catered to the target customer segment. If you like this theory because of its emphasis on innovations as a unit of analysis, then you might also be interested in disruptive innovation theory, and McLuhan's media theory. Mintrom, M. (1997). Policy entrepreneurs and the diffusion of innovation. American journal of political science, 738-770. Moore, G. A., & McKenna, R. (1999). Crossing the chasm. Ramani, S. V., SadreGhazi, S., & Duysters, G. (2012). On the diffusion of toilets as bottom of the pyramid innovation: Lessons from sanitation entrepreneurs. Technological Forecasting and Social Change, 79(4), 676-687.